Miele, the Germany-based company, has penetrated a highly competitive market environment and succeeded in winning orders for its white goods and kitchen appliances in several projects including ones in the upmarket range. Market reports said it consolidated its regional position with a growing portfolio of contract wins worth Dh85 million ($23.1 million) in recent months. The company has supplied over 21,500 appliances to some of the UAE’s most high-profile residential developments including the world’s tallest building, Burj Khalifa, and the luxury island villa community of Palm Jumeirah, said a statement. A recent report by GFK Retail & Technology highlighted an 11 per cent growth in the UAE small and medium durable appliances, taking the total value to Dh1.5 billion. 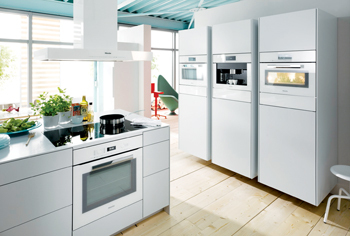 Miele is well-placed to capture a reasonable share in any future demand. “The consumer durable market is incredibly buoyant in the UAE showing extremely positive year-on-year growth. Through a range of contract wins Miele has supplied some of the UAE’s most recognised residential developments and in turn accumulated sales totalling Dh84 million for these projects alone,” added Weisenstein. Miele supplied around 7,000 appliances to the Burj Khalifa residences, including ovens, hobs, cooker hoods, dishwashers, plate warmers, washing machines and dryers; adding its own unique stamp of luxury hallmark to the 900 apartments, which sell for upwards of Dh6 million for a two-bedroom unit. The company was selected to provide Dubai’s Jumeirah Golf Estates development some 5,000 appliances ranging from state-of-the-art coffee machines and steamers to refrigerators. The development has three- to five-bedroom Mediterranean styled villas overlooking four world-class golf courses and priced up to Dh31 million. Dubai’s Jumeirah Golf Estates development, which is home to a collection of three to five-bedroom Mediterranean-style villas overlooking the four world-class golf courses and priced up to a Dh31 million, chose Miele to provide 5,000 appliances ranging from state-of-the-art coffee machines and steamers to refrigerators. The 80-storey DI Tower and ultra-opulent Palazzo Versace resort development, part of the Culture Village hub, received 2,000 Miele kitchen and laundry appliances. “Reflecting the lifestyle requirements of home-owners residing in some of the world’s most desirable community developments, Miele appliances are not only at the cutting edge of technological advancement but are aesthetically pleasing and designed to add further value to any private residence,” said Weisenstein. “Our next generation range of ovens and hobs, dishwashers, microwaves and other essential household items were selected for the Palm Jumeirah villas and were also sourced by the developer behind the prestigious Saadiyat Island apartments and residences,” he said. The firm supplied a total of 6,000 appliances to the Palm Jumeirah and Saadiyat Island residences. It also won the contract to supply Abu Dhabi’s tallest residential tower with its appliances. The 72-storey Landmark, Abu Dhabi, received 1,500 kitchen and household appliances for its collection of three- and four-bedroom apartments, all of which enjoy a prime location on the city’s popular Corniche promenade. During the business year 2013/2014, which ended on 30 June 2014, the company achieved a sales volume of €3.22 billion ($3.66 billion), corresponding to an increase of €69 million or 2.2 per cent. In its home market of Germany, the company grew by €23 million to €978 million (plus 2.4 per cent). Outside of Germany the sales growth was 1.9 per cent.